Forevermark is a fantastic brand. We recommend purchasing your diamond jewelry online. But if you decide to go to a local retailer, buying a Forevermark is the way to go. 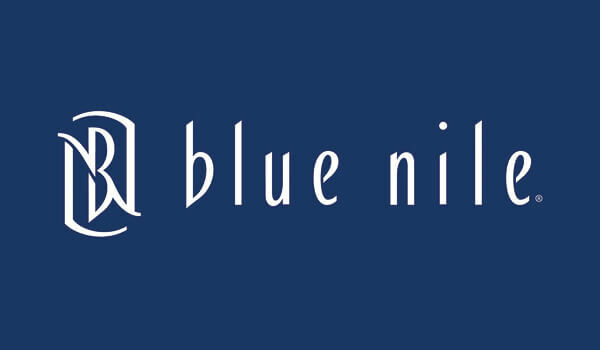 If you agree with us about buying online, you can get better value buying from a reputable online retailer like James Allen, Blue Nile or Brian Gavin Diamonds. Before getting to Forevermark diamonds, we need to look behind the brand and talk about the 125 year old elephant in the room: De Beers. De Beers has been the preeminent force behind the remarkable campaign to make the diamond ring synonymous with engagements. While primarily a mining company, De Beers is responsible for so many of the iconic marketing campaigns we have seen throughout the years. Most notable is the famous slogan “A Diamond is Forever” which has been studied in marketing classes for the last few decades. It had such staying power, many dubbed it the “Slogan of the Century”. In more recent years, De Beers has forayed into the consumer end of the business. They started by opening up De Beers stores right after the turn of the century in 2002. Since then, they have expanded their influence in the retail market in many ways. Which leads us to the point of this article. Forevermark is De Beers’ foray into jewelry branding. Established in 2008, Forevermark diamonds first appeared in Ben Bridge Jewelers. The brand quickly exploded and can now be found all over retail landscape. During my many secret shopping trips, I have come across Forevermark diamonds in high end independent jewelers like Windsor Jewelers. I have also seen their displays in your large chain jewelers like Jared. But we still haven’t answered the question. What is Forevermark. As far as I can tell, there is no specific message to the brand. While this may be a bit out of the box, I am actually a huge fan. The diamonds are not a proprietary cut, they don’t come from one specific source and they don’t seem to have commonality when it comes to their choice in jewelers they partner with. Why am I a fan? 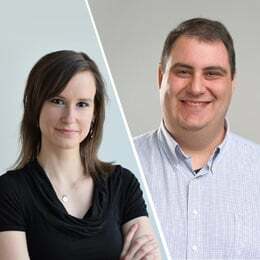 Well if you’ve spent some time on our site, you will know that we are not particularly big fans of gimmick cuts nor do we care for brand names or stores. So exactly what is so special about Forevermark? This is the big one. In this day and age, many people want to know where their products are coming from. Most people (at least those that have really dug into the matter) are satisfied with the Kimberly Process that De Beers developed to ensure your diamond will not be sourced from any conflict regions. The unique diamond code you get with each and every Forevermark ensures that the diamond had come through the channels that De Beers has set up. This is a big one. We have dozens of long form articles on our site dedicated to each diamond characteristic and how to make sure you are getting the right quality and value when you make a purchase. Many people love digging into their purchase and viewing it as a research project. For those who don’t, we are happy to help pick out a diamond for you that will be beautiful and be a great bang for your buck. But we don’t have quite the same reach as a company like De Beers does. And this is where Forevermark comes in. Forevermark uses their own grading system. While we generally recommend GIA certified diamonds only, in our opinion Forevermark has held itself to the same consistency and stringency the gold standard of independent laboratories does. Furthermore, I have had the opportunity to look at many of their diamonds. Without fail, each of them have been within the cut criteria that we recommend when purchasing diamonds. I have never seen a Forevermark diamond that I would reject due to quality. If you have read through many of our reviews or Q&As, you know that this is no small feat. To me, this is Forevermark’s strongest selling point. Yes, we can help someone find a great diamond. But our reach is severely limited. What about the overwhelming majority of consumers we don’t educate? A typical consumer can go into a retailer near them and take comfort in the fact that if they buy a Forevermark diamond they will end up with a nice stone. One issue that is a double edged sword is Forevermark’s clarity range. They offer diamonds at least as far down to SI1 clarity (I don’t know their official range). 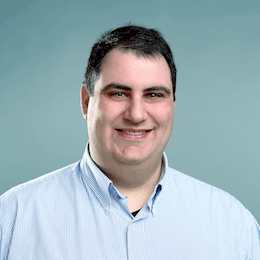 That means it’s possible there will be noticeable inclusions. We are big fans of buying an eye-clean SI quality diamond. This offers you the best bang for your buck. 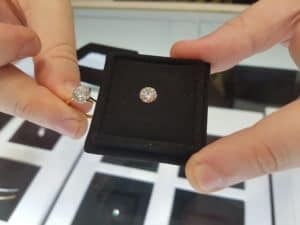 But this also means that you need to be a bit careful when shopping (look at the diamond under all lighting scenarios) which puts a bit of a damper on the “no-stress” value of the brand. This is where it gets just a wee bit gimmicky. Many brands identify their diamonds by having a unique inscription on the girdle of the diamond. Forevermark decided to put their inscription on the top of the diamond. They use some innovative technology that allows them to make an incredibly light inscription (1/20th of a micron deep) so you don’t see the inscription from the top and it has no impact on the brilliance of the diamond. The only way to see the inscription is through a microscope. 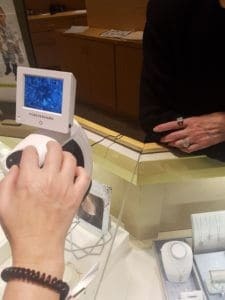 Forevermark provides the retailers with a special microscope that displays the inscription on a screen. That is, if they can get it to work. When I was secret shopping a Jared store, two salespeople spent 15 minutes trying to find the inscription before giving up. 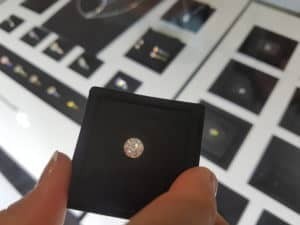 I was sorely tempted to offer to help them (I’m guessing I have more experience looking at diamonds in microscopes than anyone in the store did), but I wanted to see how it played out. Now that we’ve gotten all that out of the way, let’s get down to what we do best: Breaking down the diamonds. I’ll narrow it down to three diamonds. The first one was a 1.01ct I color, SI1 clarity round diamond that cost $10,600 at Windsor Jewelers. 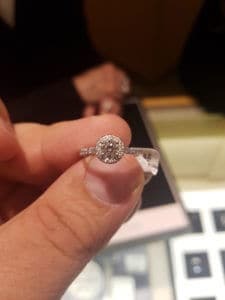 We saw this one at an independent jeweler and the diamond was offered loose (you could pair it with any setting you want). De Beers listed the cut grade as very good. This is actually a perfect use of the very good cut grade. The table was on the edge of what we would recommend (59%) but it was a nice diamond. The clarity grade was accurate, and I would recommend the diamond to one of our readers as being eye-clean. The second diamond was part of Forevermark’s “Black Label” collection which I’m assuming contains diamonds with stricter cut parameters. The diamond was a 1.10ct G SI1 and it cost $10,865. The cut on this diamond was markedly better than the cut on the previous selection. Looking at them in the display, we were confused by the pricing. The diamond was higher in color and carat weight and it was a better cut. Why then was it the same price as the previous diamond? As soon as we got a close up look at it, the answer was obvious. The SI1 clarity grade was accurate, but I was not a fan of the inclusion. Both myself and Annie could easily spot the inclusion without any magnification. We aren’t the norm (we both have excellent eyesight and look at diamonds for a living) so this may have been ok for some people, but we wouldn’t recommend it. The last diamond we’ll mention was already set in a halo engagement ring. We saw this one at a location of a large retail chain. It was a 0.46ct F color, VS1 clarity round diamond set in an 18kt white gold halo setting that had 0.25ctw of pave diamonds. The price for the whole ring was $3,599. Since this was at a large retail chain, the sales staff was not nearly as helpful and wasn’t able to find the certificate. The diamond looked fantastic to me, so I will assume it was a top notch cut. Given that it was an F VS1, there were obviously no issues with the appearance. The ring was beautiful as well (not surprising for Forevermark, but it did stand out at the chain store). We are going to compare the diamonds from Forevermark to a few different options here. Since the first one was a very good, but not excellent cut, we’ll focus on the sourcing. Some people go with Forevermark because of the added level of assurance they offer. For that, we’ll compare that diamond to a CanadaMark diamond. CanadaMark’s also have unique ID numbers where you can trace the diamond back to its source. When searching on James Allen, I was unable to find an I SI1, so we’ll use a higher quality diamond. That may not seem fair to the CanadaMark (comparing prices given the quality disparity), but I think it is. We recommend buying diamonds in I color, SI clarity range (give or take) as they offer the best value and most people can’t tell the difference. You can obviously get better quality, but I wouldn’t pay extra for it. In this case, the CanadaMark was still cheaper. Here is a 1.02ct G color VVS1 clarity diamond for $8,300. The cut was similar to the one on the Forevermark (58 table, similar depth and angles). So the CanadaMark, despite the higher quality, was about 20% cheaper. Moving on, let’s take a look at the Black Label 1.10ct G SI1. For those looking for the absolute best cut diamonds (the ones that will have the most fire and brilliance), we recommend Brian Gavin Diamonds (you can read more in our review here). Here is a gorgeous 1.11ct G color, SI1 clarity Signature Hearts and Arrows diamond for $8,510. This diamond is virtually identical to the Forevermark diamond we saw, except that I prefer the inclusions on the Brian Gavin diamond (I believe it is eye-clean). Once again, the price is about 20% cheaper than the Forevermark choice. The last Forevermark we are using was offered by the largest jewelry retailer in America. So for this one, we will compare the ring to one we find at the largest online retailer in America: Blue Nile. We found this beautiful 0.46ct E VS1 excellent cut round diamond for $1,213. I paired it with this halo setting and the total cost came to $2,893. The difference in price between Forevermark and the ring from Blue Nile was, shockingly, 20% again. Is Forevermark Worth the Premium? This is the million dollar (or, in this case, the 20%) question. Let’s get one thing out of the way. Forevermark is, by far, the best brand we’ve ever seen in a physical retailer. If you are unwilling to purchase a diamond ring online, your best bet is to purchase a Forevermark diamond at a local retailer. Is it worth paying 20% more for a Forevermark or are you better off buying a diamond ring from a reputable online jeweler? That is up to you to decide. Obviously I have no qualms buying a diamond engagement ring from one of the reputable online retailers. We have written ad nauseam about the topic on our site. But that is our opinion. If you feel that the perceived benefit of buying the diamond from a physical retailer is worth 20%, then Forevermark is the way to go. 53,343 People Have Received Honest Advice from The Diamond Pro. So Will You.